For the Jersey City neighborhood, see Bergen Hill, Jersey City. Rail routes across Bergen Hill and their terminals ca. 1900. Bergen Hill refers to the lower Hudson Palisades in New Jersey, United States, where they emerge on Bergen Neck, which in turn is the peninsula between the Hackensack and Hudson River, and their bays. In Hudson County, it reaches a height of 260 feet. The Central Railroad of New Jersey lines traveled on the CRRNJ Newark Bay Bridge across Newark Bay and through Bayonne and Greenville to its Communipaw Terminal. Portions are used by the Hudson Bergen Light Rail. The Jersey City, Newark and Western Railway (later the Lehigh Valley Terminal Railway) freight line on the bridge over Newark Bay and across Pamrapo is now used by CSX Transportation as the National Docks Secondary to Port Jersey and other points. Newark and New York Railroad Branch of the Central Railroad of New Jersey (1869), now the Hudson-Bergen Light Rail West Side Branch, ran from Downtown Newark to Communipaw Terminal. The Bergen Tunnels (1876) & (1908) under Jersey City Heights, built by Morris and Essex Railroad and the Delaware, Lackawanna, and Western Railroad, Later, the Erie Lackawanna, and now, New Jersey Transit rail lines to Hoboken Terminal. Liberty Place in Weehawken, New Jersey, was cut and tunnel for the rail line connecting the waterfront elevator to the entrance of 19th century Eldorado Park, later used by the North Hudson Railway streetcar lines. Edgewater Tunnel (1894) New York, Susquehanna and Western Railway cut and tunnel the western portal in Fairview and Hudson River portal in Shadyside, Edgewater. The North Hudson County Railway or its predecessor was responsible for many of the innovative engineering works which made streetcar travel on the east face of Bergen Hill possible, including funicular wagon lifts, an inclined elevated, a luxurious elevator, horseshoe curves, and viaducts. Other major excavations and structures for vehicular traffic have significantly altered Bergen Hill. Kennedy Boulevard at Journal Square and Journal Square Transportation Center both span the large ravine created there. The divided highway connecting the Pulaski Skyway to the Holland Tunnel runs parallel to the Long Dock Tunnel. The Lincoln Tunnel Approach and Helix connects the Lincoln Tunnel, which itself enters the Palisades before submerging under the Hudson River. Paterson Plank Road, the Wing Viaduct, Hackensack Plank Road, Pershing Road, Gorge Road are located on the face of the cliffs. Shippen Street in Weehawken is small street that makes a double hairpin turn. Bergen Hill, Jersey City has sometimes been called colloquially "The Hill", and gives name to The Bergen Hill Historic District Other prominent landmarks on the east side of the hill are the former Jersey City Medical Center (which since 2005 is being renovated and restored as an emerging neighborhood known as Beacon) and the Jersey City High School. Summit Avenue, which starts at The Junction in the Bergen-Lafayette Section follows the route of a path used by Native Americans from their settlement at Communipaw, and was used by New Netherlanders from that village on the bay to the one on the ridge at Bergen. It intersected Newark Plank Road, an early colonial "turnpike" which ran from Paulus Hook over the hill, at Five Corners, and continued north through Bergen Woods, where it connected with Paterson Plank Road and Hackensack Plank Road. ^ Manchester, James G. (1919). "The Minerals of the Bergen Archways". American Mineralogist. 4: 107–116. ^ "Hudson County High Point, New Jersey". Peakbagger.com. ^ "Pennsylvania Railroad cut, Mt Pleasant, Bergen Hill, Jersey City, Hudson Co., New Jersey, USA". Mindat.org. Hudson Institute of Mineralogy. ^ Karnoutsos, Carmela. "Bergen Arches". Jersey City Past and Present. New Jersey City University. Archived from the original on January 6, 2017. ^ "Stone above Long Dock Tunnel". Archived from the original on October 14, 2013. ^ a b "The New Bergen Tunnel" (PDF). New York Times. May 12, 1877. ^ French, Kenneth (2002). 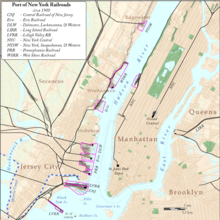 Railroads of Hoboken and Jersey City. Images of Rail. Arcadia Publishing. p. 125. ISBN 978-0-7385-0966-2. ^ NJ Transit (May 10, 2001). "NJ Transit to Begin Rehabilitation of Aging Bergen Tunnel in Early Summer" (Press release). ^ "Bergen Tunnel". Bergen Hill Tunnel & Waldo Yard Tunnel. ^ "Transactions of the American Society of Civil Engineers, vol. LXVIII, Sept. 1910The Bergen Hill Tunnels. Paper No. 1154". Transactions of the American Society of Civil Engineers. LXVIII. September 1910 – via Project Gutenberg. ^ "A Substantial El Dorado; Weehawken's Counterpart of the City of Gold" (PDF). New York Times. July 17, 1892. ^ "Design and Construction of the Weehawken Tunnel and Bergenline Avenue Station for the Hudson-Bergen Light Rail Transit System". TRB Publications Index. The National Academies of Sciences, Engineering, Medicine. November 2003. ^ "New York - West Shore & Buffalo RR tunnel, Weehawken, Bergen Hill, Hudson Co., New Jersey, USA". Mindat.org. Hudson Institute of Mineralogy. ^ "The Palisades Tunnel; It May Be Completed Before the Year Ends" (PDF). New York Times. March 17, 1893. ^ "Palisades Tunnel". New York Times. Archived from the original on 2003-05-15. ^ "New York - Susquehanna & Western Railroad tunnel, Edgewater, Bergen Co., New Jersey, USA". Mindat.org. Hudson Institute of Mineralogy. ^ "Bergen Hill Historic District map". City of Jersey City. ^ Olszewski, Anthony (2002). "From Before the Revolutionary War! Jersey City's Oldest House". City of Jersey City. This page was last edited on 16 February 2019, at 23:49 (UTC).